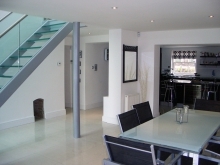 A standard 1960’s estate house with flat roof rear extensions was completely refurbished and its character transformed. Removal of the rear flat roof extensions opened up internal rooms to the south facing garden. 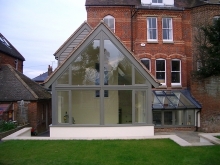 A new pitched roof sunroom extension connecting to the existing house with folding doors to allow for an extended dining area seating over 20 people. The existing roof was replaced by a steeper pitch roof providing additional accommodation including a study workspace with views over the surrounding countryside. 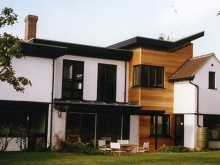 The project transformed the external appearance of the building with new windows throughout, the first floor clad with timber feather edge boarding, the ground floor rendered over the existing poor quality brickwork, and the creation of a new facing brickwork porch extension.